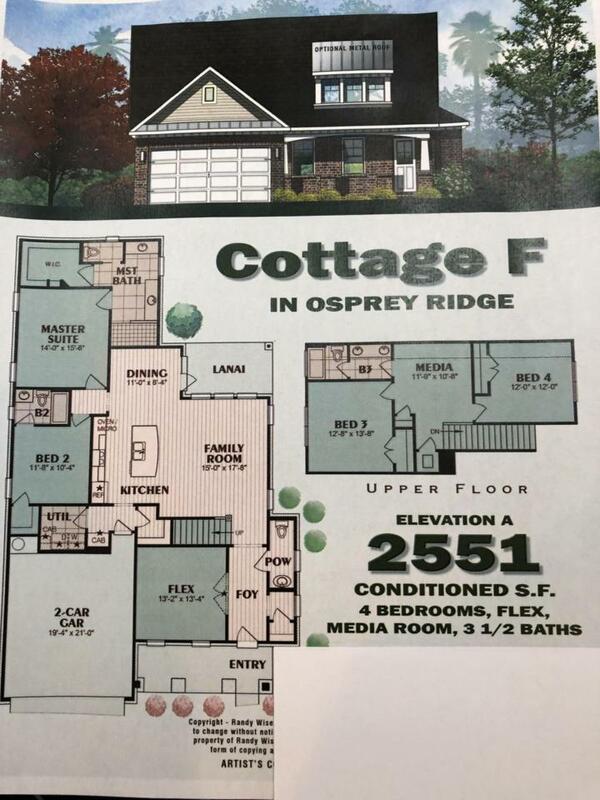 The Cottage F features 2551 Sqft 2 story 4 bedroom,3.5 bath. All brick with hardy board accents. Includes large covered front porch and covered Lanai in rear. This beautifully open plan features large family room, kitchen island, dinning room, media room and large flex room for home office, 2nd family room or 5th bedroom , Smart security system and Pavers on drive and sidewalk to home. This quaint 16 lot community offers natural gas, a stunning landscaped brick entrance with sidewalks throughout. Randy Wise Homes is proud to offer this amazing house plan and new subdivision as part of our 40 year celebration of excellence in building in Niceville. Randy Wise is widely known as the best builder in the area and believe Osprey Ridge will only enhance this reputation.